Now that summer is approaching, I am all about smoothies. For breakfast, for a snack, or just for fun. 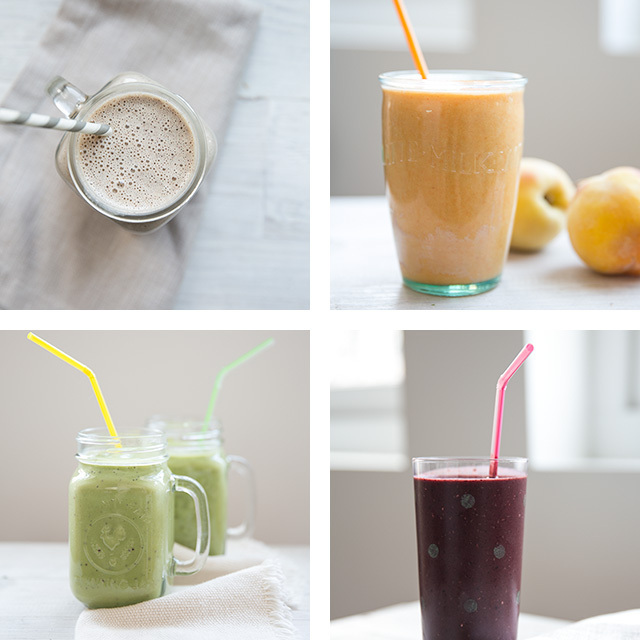 Today, I am sharing my four of my favorite smoothies recipes over at Modern Parents Messy Kids. Head over there for some juicy info on all the super ingredients in these smoothies, and of course, for some more pretty pics. To make the smoothies, it is best to add the liquid first, and then about half of the ingredients. Blend, and then add the remaining ingredients. At the end add about 3-4 ice cubes and blend one last time. Always be sure to remove any stems or seeds from the fruit, and if your ingredients are organic do not peel the skin (they contain lots of healthy nutrients). Also, be sure to dice the ingredients, it makes for easier blending. Always look for what is fresh and in season, and organic is always best. Frozen is great too, especially for the fruits that are not in season, but be sure to look for frozen organic ingredients as well. The ingredients listed here are mostly a guideline. Feel free to add in other ingredients that you think would work well or leave something that you do not like or have on hand. Experiment. Find out what works for you. You can make these ahead of time, and store them in an airtight container in the fridge. Mason jars work great for this. They will stay fresh for about 1-2 days.